What is the FORECAST.LINEAR Function? 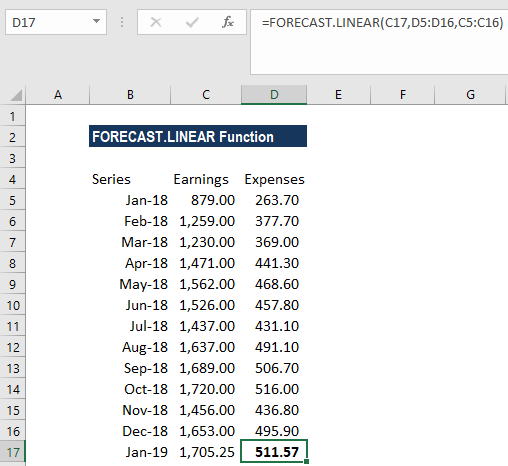 The FORECAST.LINEAR function is categorized under Statistical functionsFunctionsList of the most important Excel functions for financial analysts. This cheat sheet covers 100s of functions that are critical to know as an Excel analyst. It will calculate or predict a future value using linear regression. In financial modelingFree Financial Modeling GuideThis financial modeling guide covers Excel tips and best practices on assumptions, drivers, forecasting, linking the three statements, DCF analysis, Excel modeling and much more. Designed to be the best free modeling guide for analysts by using examples and step by step instructions. Investment banking, FP&A, research, the FORECAST.LINEAR function can be useful in calculating the statistical value of a forecast made. For example, if we know the past earnings and expenses that are a certain percentage of sales, we can forecast the future amount using the function. X (required argument) – It is a numeric x-value for which we want to forecast a new y-value. Known_y’s (required argument) – It is the dependent array or range of data. Known_x’s (required argument) – It is the independent array or range of data that is known to us. 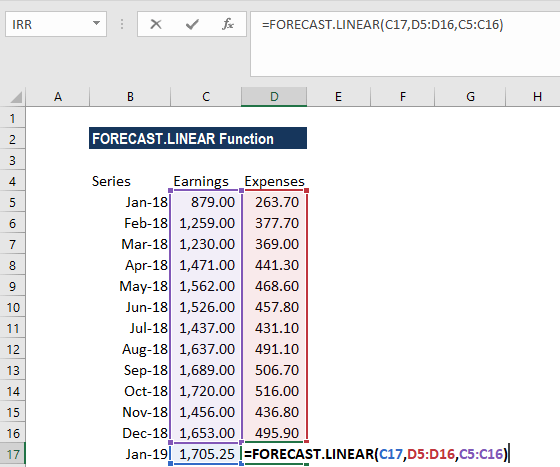 How to use the FORECAST.LINEAR Function in Excel? Suppose we are given earnings data below, which are the known x’s, and expenses, which are the known y’s. We can use the FORECAST.LINEAR function to predict an additional point along the straight line of best fit through a set of known x- and y-values. 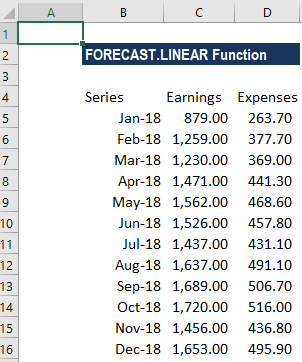 Using the earnings data for January 2019, we can predict the expenses for the same month using the FORECAST.LINEAR function. The values of x and y are the sample means (the averages) of the known x- and the known y-values. The length of the known_x’s array should be the same as that of the known_y’s, and the variance of the known_x’s must not be zero. The FORECAST.LINEAR function was introduced in Excel 2016 (to replace the old FORECAST function). The FORECAST.LINEAR function is no longer available in earlier versions of Excel. It is also not available in Excel 2016 for Mac. #N/A error – Occurs if the supplied known_x’s and the supplied known_y’s arrays are of different lengths. #DIV/0! error – Occurs if the variance of the supplied known_x’s is equal to zero. #VALUE! error – Occurs if the given future value of x is non-numeric.